Purdue is 32-4 at home in Big Ten play since 2014-15 but needs a win against No. 23 Maryland on Thursday as 7-point favorites to avoid a disappointing fourth straight loss to ranked opponents. Joe Rodgers is a sports analyst specializing in betting odds and fantasy. He has spent time with Perform Group Media, earned a master's degree, and is even a certified pace car driver. Purdue is 32-4 at home in Big Ten play since 2014-15 but needs a win against No. 23 Maryland on Thursday to avoid a fourth-straight loss to ranked opponents. Purdue is a 7-point favorite as they welcome the Terrapins, according to betting lines posted in Las Vegas. Purdue (5-3 SU, 5-3 ATS) has dropped out of the top-25 rankings after road losses to Florida State and Michigan over the past nine days. 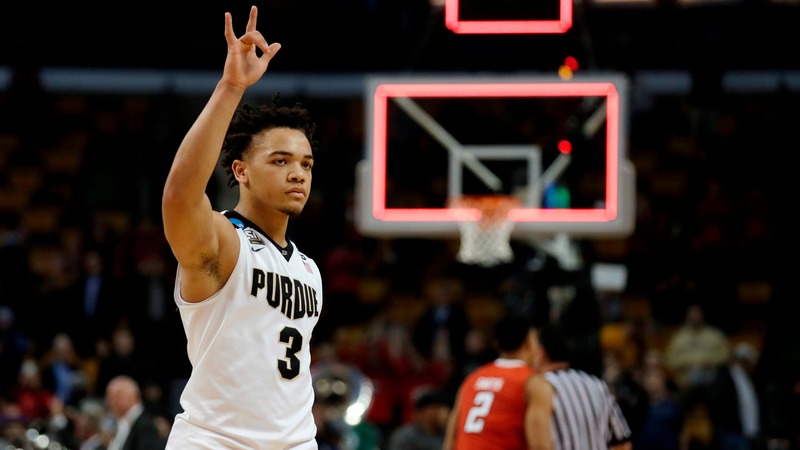 Travel was not helping the Boilermakers, but neither was their shooting and play of Carsen Edwards. The Player of the Year candidate leads the Big Ten in scoring, but he shot just 14-of-40 in the past two losses. Maybe the Boilers' first home game since Nov. 23 will help kickstart the 3-point oriented offense, but a matchup with Maryland is a tough one. Purdue ranks sixth nationally in 3-point distribution, as 43.5 percent of their season's points have been from long range, according to KenPom. Edwards, Ryan Cline and freshman Sasha Stefanovic have combined to shoot 166 3-pointers in eight games. The Boilers' bigs of Evan Boudreaux and Matt Haarms also have the team [in the top 15](https://kenpom.com/gameprep.php?g=1497) in offensive rebounding rate (38.5 percent of possessions). Great stats, but the Terps' defense matches up perfectly with Purdue's strengths. Maryland (7-1 SU, 3-5 ATS) is limiting opponents to just 30.3 percent shooting beyond the arc and held Penn St. to just 5-of-21 in a 66-59 road win on Dec. 1. The Terps' 6-10 duo of Bruno Fernando and Jalen Smith has the team 18th in defensive rebounding rate, 17th in FTA/FGA, and fifth in offensive rebounding rate. Second-chance points for both teams could be few and far between, which makes a case for UNDER 148.5 points, but Maryland +7 is the bet to consider on Thursday (6 p.m. CT, BTN). __MORE:__ [Odds to win Naismith College Player of the Year](https://www.betchicago.com/odds-naismith-college-player-year-zion-williamson) ## Maryland vs. Purdue KenPom prediction Purdue 78, Maryland 71 __Play and win:__ [Join our free contests](https://betchicago.chalkline.com/) ## College basketball betting lines, tips for Thursday, December 6 *Odds from Westgate LV SuperBook; all times Central Note: Games below are nationally televised. For complete schedule [click here](http://www.espn.com/mens-college-basketball/scoreboard/_/group/50/date/20181206). __Charlotte at Wake Forest (-11, 135), 6 p.m., ACC Network__ Betting tip: Demon Deacons are 1-6 ATS in their last seven games as a favorite. __Oakland at Fairfield (-3, 148), 6 p.m., ESPN3__ Betting tip: UNDER is 13-3 in Oakland's last 16 road games. __Iowa State (-1.5, 153) at No. 18 Iowa, 7 p.m., FS1__ Betting tip: Cyclones are 4-11 ATS in their last 15 road games. __Drake (-1.5, 148.5) at Milwaukee, 7 p.m., ESPN+__ Betting tip: OVER is 13-3 in Drake's last 16 games as a favorite of 0.5-6.5. __Utah Valley at Arizona (-14.5, 144.5), 8 p.m., PAC12__ Betting tip: UNDER is 8-2-1 in Wildcats' last 11 overall.